Standard Entry includes free race photos, a technical finisher tee, a medal and a goody bag full of swag, as well as some great pre and post-race entertainment in the Fitness Village. Half Marathon Plus Perks Entry and Team Challenge Entry includes all that with Standard Entry as well as posh loos, private baggage check and race day hospitality. There will be eight aid stations on the Half Marathon route at; 1.5, 3.25, 4.75, 6.25, 8.25, 9.5, 11.25, and 12 miles. Download the new Virgin Sport app from Apple and Google Play stores to keep up with the latest. Track runners, see the schedule of events, get helpful transportation directions and even check the weather – all with a simple tap. 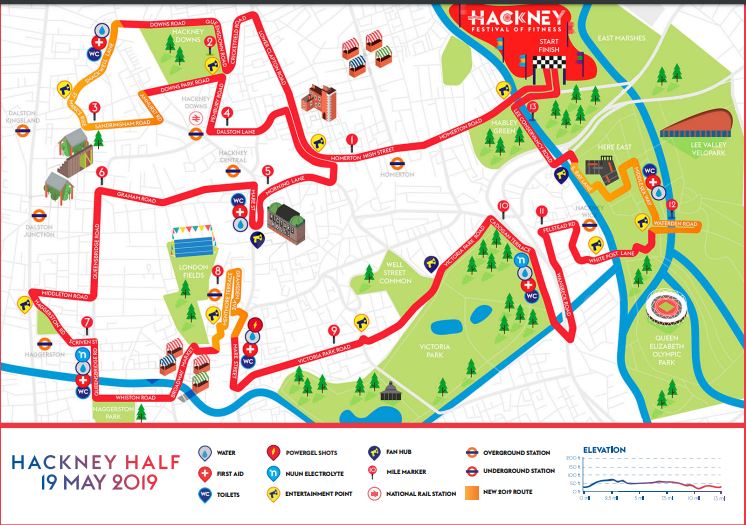 There will be thousands of runners, fans and supporters heading to Hackney Marshes for the Virgin Sport Hackney Half Marathon. With a record 20,000 runners taking part this year, it is strongly recommend that you arrive at the Hackney Marshes AT LEAST ONE HOUR before the race starts. Stratford Station: Central & Jubilee Lines, & National Rail (25-minute walk to the Festival Village through Queen Elizabeth Olympic Park). Please note the due to engineering works there will be no service on the DLR between Canary Wharf and Stratford. Leyton Station: Central Line (20-minute walk to the Festival Village). Homerton Station: London Overground will be running 4 additional services per hour from 07:00 – 09:00 in each direction, between Camden Road & Stratford. Homerton Station is the closest station and is a 15-minute walk to the Festival Village. From 09:00 onwards the usual Sunday timetable will be in operation. Clapton Station: London Overground (30-minute walk to the Festival Village). There will be signs and marshals wearing high visibility vests to guide you from Stratford, Leyton and Homerton stations to the Festival Village on Hackney Marshes. If you are planning to cycle, there will be numerous bike parking facilities within the Festival Village. To secure your bike to the rack you need to lift the bike up and position the front part of the saddle over the metal bar. Please note bikes will be left at the owner’s risk. To secure your bike to the racking please bring an appropriate cable or chain lock. Virgin Sport Hackney is a festival of fitness for every body. Spectators (or as we like to say, spectathletes) can take Go Fit Yourself bootcamp style classes led by London’s leading fitness instructors, or chill out at one of our dedicated Fan Hubs. Once the hard work is done, it’ll be time to celebrate just as hard with local food, flavours, beers, entertainment and more. Get your entry now! In return for volunteering, you'll get a breakfast or lunch, a Virgin Sport event cap and FREE entry into a Virgin Sport event within one year (subject to minimum age limits that apply to each of our events). Visit the Virgin Sport website for further details. Depending in your ticket option, race packs will either be posted to you can collect it from the Festival Village in Hackney Marshes. Dates of collection will be Friday 17th and Saturday 18th May. If you can’t make it to the Festival Village before the race, you can have someone collect it for you. – An email or printed copy of the registered runners confirmation email (which should have been emailed to the runner when they registered). Yes. You must be at least 17 years old to participate in the Hackney Half Marathon. Entries are capped for the Half Marathon and registration will close as soon it's full - so be quick! Why not enter the Hackney Half as part of a team. A minimum of 4 tickets is required to enter the Hackney Half Team challenge. After a few years, the hackney half is a damn good race now. The event village is impressive, the route is nice and has some very nice east London locations covered, the crowds are also amazing. East London is a place very proud of itself. Nice t-shirt as well. This is a very good race. Good route taking in some great landmarks and parts of Hackney and very well organised. A really great race, absolutely loved the atmosphere, it was like a mini London Marathon! Lots of lovely people lining the streets cheering you on. It was a really hot day but they had lots of water stops and Nuun electrolyte drinks. Really worth the price. An absolute cut above other races in organisation, atmosphere and number of entrants. It was a proper festival with food stands, music and a main stage. Bag drop was super slick, always a huge queue for the loos but generally everything was extremely well organised. Course is definitely 'undulating' though! Though London courses are never the most beautiful, but Virgin Sport do an incredible job of making an awesome vibe - having the beer tents, music and general Hackney 'hipster' vibe of course helps with this - loved the new addition of the 'ramp of doom' as well to the race! Though it did feel a little on the pricey side, it didn't overly bother me as the party directly afterwards makes a whole day of it - how many things like this can you do in London for cheaper these days anyway?! Overall I highly recommend it, and a real chance to post a decent time whether just starting your running journey or competing to be your best! Loved this race last year! Such an awesome atmosphere along the whole route with bands everywhere and huge crowds. The event village afterwards was great. Would probably get my vote for the best half marathon in the country - worth the premium price. Really great atmosphere with crowds and music around the course. It was SO hot that year, but there were loads of drink stations, which kept us going! I was awarded a freebie to this race through Asics and was really impressed. Real community based event and the local crowd support was fantastic throughout. With the number of participants, the toilet queue was always going to be long which they were. The last part of the course around the Olympic stadium is quite bumpy with a few up and downs but other than that I felt it wasn't that bad. Third attempt of this course and each time I forget... it’s not flat. The first few miles are on a slight incline and there are a couple of unfriendly bumps (yes, I hate hills of any kind), but despite this, it’s quite a nice course. Community spirit is usually out in full force, although this year it seemed more quiet than usual. Running through the shops area was as entertaining as ever, more costumes in the supporting crowd than amongst the runners (the devil offering booze was a hit) but there are some less supported areas that could do with a bit of entertainment added. The High5 gel station was an added bonus, but still have trouble with the drinks in cups situation. The sheer amount of people in the area near the finish saw bottlenecks and impatient spectators climbing fences and crossing roads across the path of runners which at times was a bit dangerous and rath annoying, but the race shouldn’t be judged by some people’s lack of common sense, although a bit more marshalling action would have been useful.It’s a rather expensive half, and not even the post run goodies makes up for that. The rewards area and exit was a bit chaotic, but the bag drop and toilet situation is pretty good and plenty of refuelling options at the after-race festival. Bring a friend to mind the bags, take a picnic/bottle of fizz and enjoy the post-run buzz at the fitness festival afterwards. Just don’t forget that there’s quite a long walk back to the station when you’re done. First timer and I enjoyed the fast and (not) flat course. They weren’t really prepared for the 20k runners as there were not enough toilets and facilities. The organisers could have probably done with starting the event at 10 or even 0930 as it was a real push for a lot of people to get there on time with a reduced train service running on a Sunday to Stratford and then the 25 min walk. The course was good, the crowds were a bit quiet in places just standing there which was odd. It is definitely hillier than advertised which I don’t mind but why say it’s flat and fast? The finish and then the exit was well organised with nice bling and goody bag. Overall I’d say it’s a good event defo one to do but I just wish they’d set everyone off a pinch later so you aren’t rushing and get more toilets! Can I collect my pack before the day of the event ? Hi there. Just to let you know that you can collect your race pack on the Friday or Saturday. Good luck! Lace up and experience the citys most iconic landmarks with a very British 10k. Run by Trafalgar Square, the Embankment, Big Ben and more. This flat and iconic course is ready for your best time and your best selfie. Do it for the Queen, do it for your country or do it for the glory that is summertime in London. Run the iconic ASICS London 10k straight through the heart of the city. Price includes race, free photos, ASICS tee, medal, tote bag and spectator app. This headline running event will include a British Street Party - with a twist! In addition to a 10k through London's famed sites, there will be music at every kilometer - you'll be pounding your feet to the beat. Fall in love with Oxford, The City of Dreaming Spires, while running this flat and fast route. Just a little over an hour away from London, come discover this city thats famous the world over for its University, architecture, and place in history.